Injecting life into urban landscapes is one of Andrea Wall's steadfast passions. To coalesce vibrant habitats in Southwest Portland, Wall has beckoned pathways, cleared invasive species and planted native species. But the bug hotel — which is a structure designed to provide shelter for insects — she built on S.W. Idaho Street behind Mittleman Jewish Community Center is potentially her most off-the-wall restorative contribution yet. In the midst of building a native pollinator garden in the same location, Wall remembered learning of the bug hotel while perusing Amazon.com. And seeing a post sitting next to the garden, she thought it would be the perfect place for an insect respite. "So I thought, 'Well, let's put a bug hotel on it in the pollinator garden.' It seemed to make sense," Wall said. The main purpose of the hotel is to provide a space for solitary pollinator bees to incubate. The hotel has tubes for bees to lay eggs and Wall facilitates the bees' transformation from egg occupation to pollination. "They put a lot of life in a little bit of time," Wall said. "They hatch, they mate, they lay eggs, they fly around and pollinate and then they die. It's a pretty short lifecycle but they do a lot of good while they're out there." Wall said the hotel is blue and red because the bees are attracted to those colors and includes a "studio apartment" that has pine cones and other nuggets. 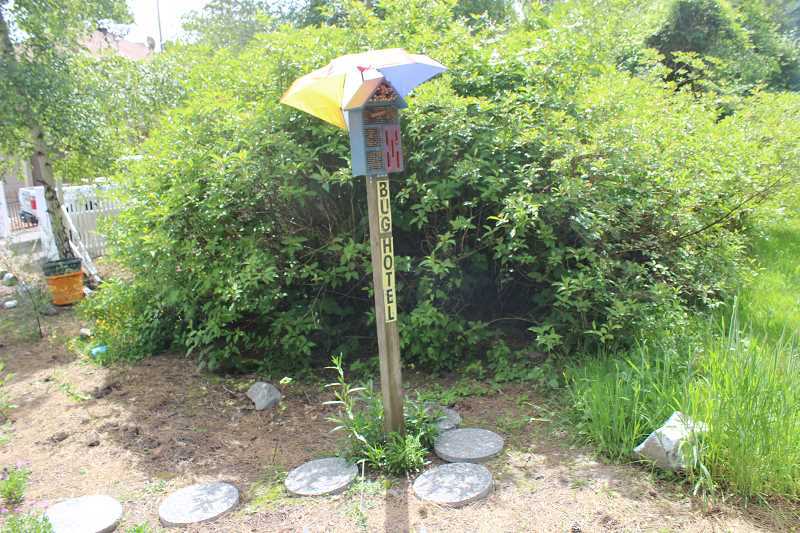 The hotel also includes narrow slots for butterfly access and an umbrella hangs over the hotel to keep birds at bay. "It's (the hotel) providing shelter and protection from the birds and the weather," Wall said. Wall is currently in the midst of nurturing the year-long lifecycle of a pack of mason bees. Wall chose mason bees because of their pollination abilities and because they're native to the area. "And they stay right in one area rather than fly many miles like a honey bee might looking for nectar. They're prolific pollinators, much better than honey bees. And so a lot of people in this area have taken it upon themselves to help the mason bees survive," Wall said. To harvest mason bee cocoons, Wall puts tubes of eggs inside her refrigerator until there are five consecutive days of 55 degree weather or greater and when there are enough flowers in the area to support the male bees, who haven't eaten in months. In April, 125 of Wall's 130 cocoons hatched. "It's amazing within two or three days they have all flown out. And then about three days after that you see the females are laying eggs out of the tubes and building walls in between each nest," Wall said. The female bees live longer than the males and are more productive. "They're the ones that do much more pollinating and are much more efficient than honeybees are," Wall said. "They stay right within 300 feet of the nest so it's important to have a native pollinator garden or flowers or fruit trees around so that they have something to eat and something to put in each cubicle." Wall has heard many neighbors and children comment on the bug hotel and said it has become a meeting place. "'Meet me at the bug hotel.' They all seem to know where it is," Wall said. "The kids come and look at it, and say 'Look, just about all the tubes are full.' They thought that was pretty neat." Wall will put two more bug hotels up for raffle at Multnomah Days in Multnomah Village this August. Aside from the bug hotel, Wall's restoration efforts aren't over. However, she has run out of grant money. "We have a lot more weeds and blackberry bushes and non-natives to remove," she said.